Robert Harvey Harold Hugman. Courtesy of Find-a-Grave. Image available on the Internet and included in accordance with Title 17 U.S.C. Section 107. Robert and Martha Hugman. Courtesy of Find-a-Grave. Image available on the Internet and included in accordance with Title 17 U.S.C. Section 107. HUGMAN, ROBERT HARVEY HAROLD (1902–1980). Robert H. H. Hugman was the architect of San Antonio’s WPA River Walk, one of the world’s most distinctive urban linear parks. He was born at San Antonio, Texas, on February 8, 1902, to Robert C. H. Hugman, a carpenter who had emigrated from England, and Annie (Weik) Hugman, a native San Antonian. He graduated from Brackenridge High School and went on to study architecture and city planning at the University of Texas in 1920. He left in 1924 without graduating and took a job as a draftsman in New Orleans. When Hugman returned in 1927 to open an architecture practice in San Antonio, the city was in the midst of a flood prevention program begun just prior to the devastating flood of 1921. Even before the flood, the city council had rejected engineers’ recommendations to clear trees along the picturesque nearly half-mile Great Bend in the heart of downtown and pave its bed as a flood channel. Instead, the city was building a bypass channel with a low dam at its upstream end to deflect the river’s normal flow around the bend, preserving the bend while allowing floodwaters to flow over the dam and into the bypass channel. Mayor C. M. Chambers incorporated Hugman’s concept into a cut-rate master plan that would avoid the fees proposed by noted city planner Harland Bartholomew of St. Louis. But Bartholomew was backed by San Antonio Conservation Society members and other civic leaders who had been trying for years to get a professional master plan undertaken, and he was hired. Bartholomew favored maintaining the traditional River Park, opened by the city in 1914 through downtown and around most of the Great Bend. 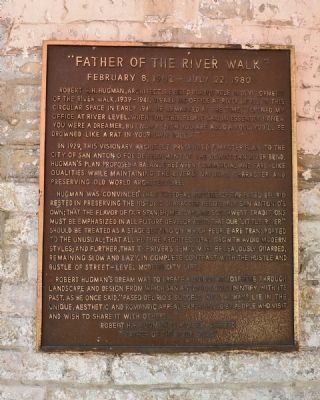 "Father of the River Walk" Plaque for Robert Hugman. Image available on the Internet and included in accordance with Title 17 U.S.C. Section 107. Hugman, pushed aside, kept working on such projects as his Spanish Colonial Revival residence for William A. Turner (1928) in the suburb of Olmos Park. But he continued to advocate his river plan before any group that would listen. With the Depression he went on the federal payroll as a planner with the Works Progress Administration (later called the Work Projects Administration), under State Administrator Henry P. Drought and District Director Edwin P. Arneson. He helped reconstruct Woodlawn Lake and Seguin’s Starke Park, where he designed stone walkways beside Walnut Creek and the Art Deco Recreation Building (1938). 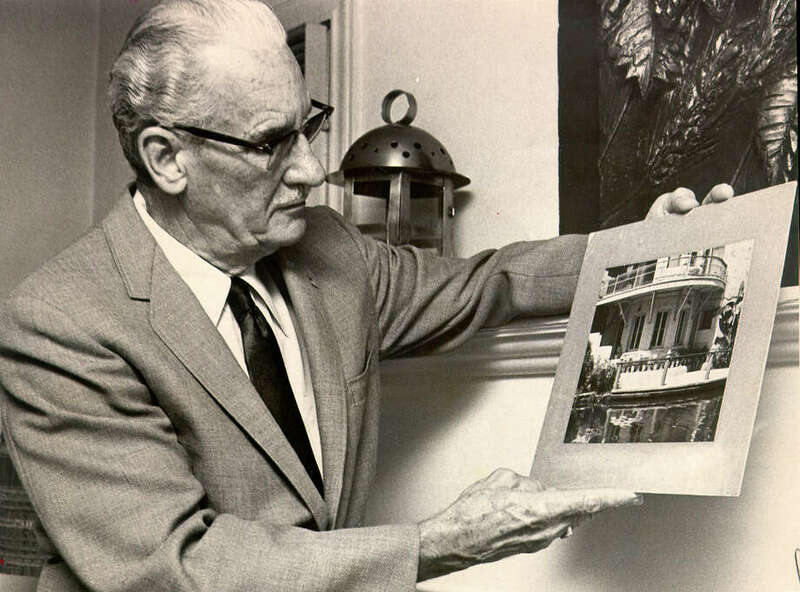 His vision for the San Antonio River eventually came to the attention of A. C. (Jack) White, manager of the swank new Plaza Hotel at the end of the Great Bend and a future mayor of San Antonio. White met with Hugman, Drought, and Arneson and came up with a way for the WPA to do the work. A riverside improvement district raised local tax funds. Congressman Maury Maverick secured federal WPA funding. In the summer of 1938 Hugman became the WPA’s architect for the project. Construction of the San Antonio River Walk (circa 1930). Courtesy of the University of Texas at San Antonio Institute of Texan Cultures. Image available on the Internet and included in accordance with Title 17 U.S.C. Section 107. Ground was broken on March 29, 1939, for the River Walk, no longer termed Aragon and Romula. The lane down from Houston Street was eliminated in favor of multiple distinctive stairways from streets above. The River Walk would be slightly longer than the old River Park and extend from Lexington Avenue at the north more than a mile around to the end of the Great Bend. The riverbed was scraped, and the old River Park’s even, concrete-plastered channel walls were replaced with slightly irregular limestone walls that gave the appearance of a natural channel. The greatest concentration of new features would be within the protected Great Bend. It was drained and those plants that could be moved were temporarily moved out. Hugman designed a lighting system, wrought iron signage and gates, meandering stone sidewalks of alternating design, rustic cedar benches, two arched bridges, water features, and semitropical landscaping. A junkyard was replaced with the signature Arneson River Theater, named in honor of the WPA’s recently deceased district director. Robert H. H. Hugman. Courtesy of the San Antonio Express-News. Image available on the Internet and included in accordance with Title 17 U.S.C. Section 107. San Antonio River Walk. Image available on the Internet and included in accordance with Title 17 U.S.C. Section 107. But the unsightly bed of the drained, beloved river lined with bright, freshly cut limestone in fanciful patterns was becoming too much for many civic leaders and conservationists, who still preferred the staid appearance of the old River Park. Even the distinguished architect Atlee B. Ayres complained that Hugman’s project was not being done “in a simple manner” and that, “with few exceptions, it is a most unwise expenditure and will be a source of ridicule to our tourist friends and others.” But Hugman remained adamant that the bright limestone would mellow with age and that landscaping would soften what appeared to be harsh effects. He refused to reduce his use of stonework. In March 1940 he learned that Congressman-turned-Mayor Maury Maverick had quietly redirected a new shipment of stone to the WPA’s adjoining La Villita project. Hugman filed a formal complaint to his oversight committee, chaired by Jack White. To Hugman’s dismay, the committee, tired of the controversies, unanimously fired him. Most of Hugman’s key elements, however, were already in place, and the landscape architect hired to replace him—J. Fred Buenz—simply worked around them. In March 1941 the WPA signed over to the city 8,500 feet of riverbanks with 17,000 feet of new sidewalks, 11,000 cubic yards of masonry, 31 stairways, 3 dams, and some 4,000 trees, shrubs and plants. Map of the San Antonio River Walk. Image available on the Internet and included in accordance with Title 17 U.S.C. Section 107. Although the commercial development he foresaw was not materializing, Hugman sought to demonstrate the setting’s viability by opening an office in a riverside basement at the foot of a stairway to Commerce Street. In 1947 a few doors down the street, he formed the firm of Hugman & Silber with longtime architect Paul George Silber. They entered a competition for another riverside project, the National Park Service’s Jefferson National Expansion Memorial beside the Mississippi River in St. Louis, but were unsuccessful. After the relationship with Silber ended, Hugman practiced on his own until 1957, when he went to work as an architect at nearby Randolph Air Force Base. He retired in 1972. Robert Hugman in San Antonio. Courtesy of Steve Krause and San Antonio Express-News. Image available on the Internet and included in accordance with Title 17 U.S.C. Section 107. Statue and Plaque for Robert Hugman in San Antonio. Courtesy of Sean Paul Klinksiek. Image available on the Internet and included in accordance with Title 17 U.S.C. Section 107. Grave of Robert H. H. Hugman. Courtesy of Find-a-Grave. Image available on the Internet and included in accordance with Title 17 U.S.C. Section 107. In 1970, as the River Walk was at last becoming commercially successful, Hugman was rediscovered and honored with an award from the San Antonio Chapter of the American Institute of Architects. After that, he made occasional public statements urging “good taste, beauty, quiet dignity, satisfying aesthetics and good food” along the fast-developing River Walk. In 1978 he did the first striking of the bells named in his honor and finally hung at the Arneson River Theater. Robert H. H. Hugman died at San Antonio, Texas, on July 22, 1980, and was buried in City Cemetery No. 6. In 1924 he had married Martha Aurora Smith of Austin, who died in 1941. They had two children—Robert H. H., Jr., and Anne Karin (Mrs. William Robinson). His 1948 marriage to Julia William ended in divorce. In 1968 he married Elene Barnby Newman, who survived him. He was a member of Madison Square Presbyterian Church. Lewis F. Fisher, American Venice: The Epic Story of San Antonio’s River (San Antonio: Trinity University Press, 2015). Lewis F. Fisher, Saving San Antonio: The Precarious Preservation of a Heritage (Lubbock: Texas Tech University Press, 1996). Robert H. H. Hugman, “Bexar County Historical Commission Oral History Interview with Doris Dupre, 1977,” University of Texas at San Antonio Institute of Texan Cultures Oral History Collection. Robert H. H. Hugman (1902–1980) Drawings, 1938–1939, San Antonio River Walk, San Antonio, Texas, the Alexander Architectural Archive, the General Libraries, the University of Texas at Austin. Robert H. H. Hugman, “How Paseo del Rio,” Delivered at Arneson River Theater bells dedication, Nov. 1, 1978, Typescript in San Antonio Conservation Society files. Robert H. H. Hugman, “Speech to San Antonio Historical Association,” 1975, Bexar County Historical Commission Oral History Program, University of Texas at San Antonio Institute of Texan Cultures Oral History Collection. Vernon G. Zunker: A Dream Come True: Robert Hugman and San Antonio’s River Walk, rev. ed. (San Antonio: V. G. Zunker, 1994). Handbook of Texas Online, Lewis F. Fisher, "HUGMAN, ROBERT HARVEY HAROLD," accessed April 23, 2019, http://www.tshaonline.org/handbook/online/articles/fhu54. Uploaded on December 22, 2015. Modified on October 24, 2016. Published by the Texas State Historical Association.